Easy to transport and very economical, the Artista is a tabletop potter's wheel that stores easily. 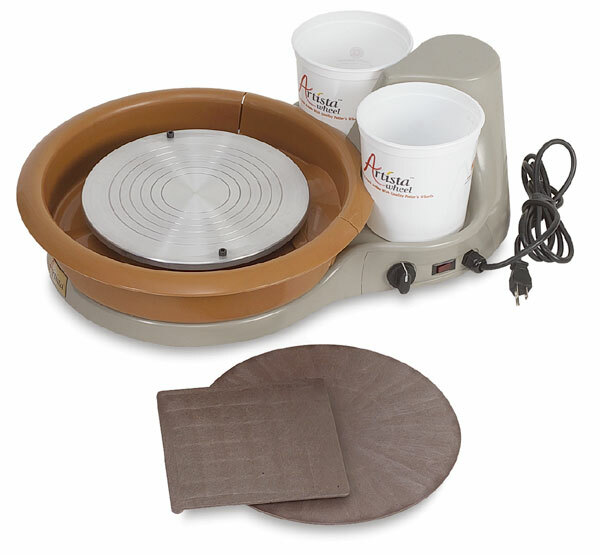 It features a two-part removable splash pan, with space for two 2-1/2 quart buckets. Features include plastic and steel construction, a smooth-running 1/3 HP motor, a hand-controlled, variable speed (0–220 rpm) Micro V-Belt, and enclosed working parts for safety and ease of cleaning. The 11"Dia wheel head has a a 25 lb centering capacity. Also included are two bats. The Artista Potter's Wheel is available with a right-handed or left-handed wheel direction. Optional accessories include folding legs, static legs, and a foot pedal. 115 VAC. Weighs 35 lb. 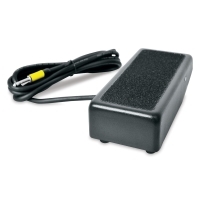 Foot Pedal — Convert the Artista Potter's Wheel from hand-operated to foot-powered with this plug-in foot pedal. Folding Legs Set — These folding aluminum legs can be attached to the Artista to accommodate seated throwing. They detach for ease of portability and storage. Static Legs Set — These steel legs take the Artista from the tabletop to a comfortable 22" height for stable seated throwing. ® Speedball is a registered trademark.™ Artista is a trademark.